Those of you who follow me on social media have probably watched my progress lately, and I finally finished field-testing my new 10th Doctor suit pattern! I'm very pleased with this new pattern, and I'm excited to make it available for pre-order at a 10% discount! This updated version is FAR superior to the previous (2016) version. In fact, I've so heavily revised it that it's basically an entirely new pattern! Updates include a much-improved fit and silhouette, additional sizing, and refined details. I also adjusted the markings/guides to correspond to Magnoli Clothiers' updated replica fabric. This new pattern includes both jacket AND trousers in men's sizes 34-52, and it can be used to make both the brown AND blue suits! As always, I meticulously drafted it to be as faithful to the originals as possible. This pattern will begin shipping on Monday, March 18. All-new, FREE sewing tutorials (intended for use with this pattern) are coming soon here on the blog! FREE blue fabric shipping to Magnoli Clothiers! As you probably know by now, I recently had a run of 10th Doctor blue suit fabric rewoven, directly from a swatch of original material provided by Louise Page herself! 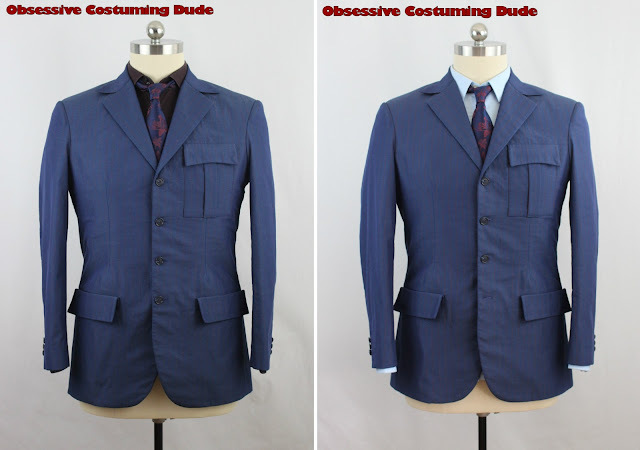 While I had primarily intended the fabric to be for DIY types (like myself) to make their own replica suits, I’ve gotten a lot of inquiries from people wanting a custom suit made for them. 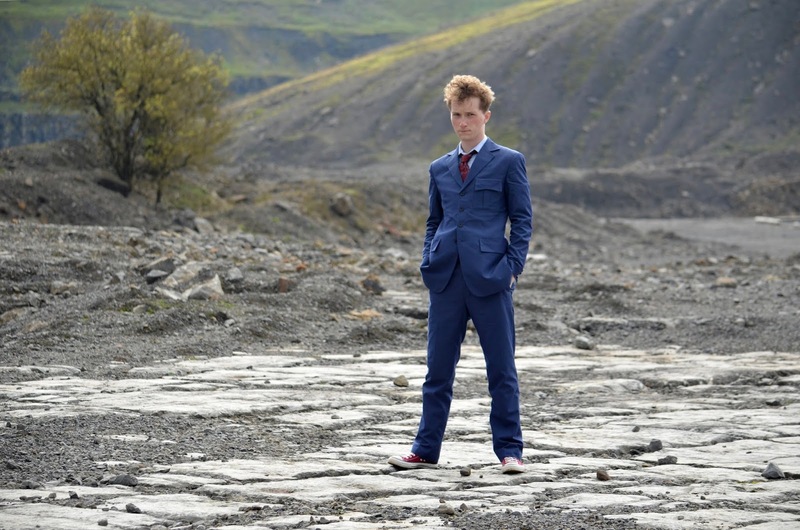 I usually recommend bringing my 10th Doctor suit pattern to a local tailor, but I’ve seen some people on Instagram who’ve had some good results with online vendors. 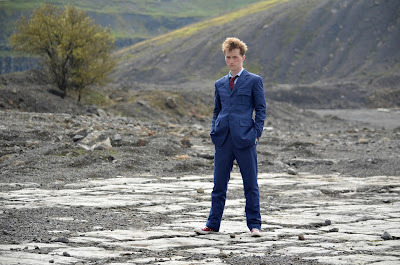 In fact, Thomas Dunn (“doctorwhocollector” on Instagram) actually sent his yardage of my rewoven blue fabric to Magnoli Clothiers to have his suit made, and they appear to have done a great job with it! 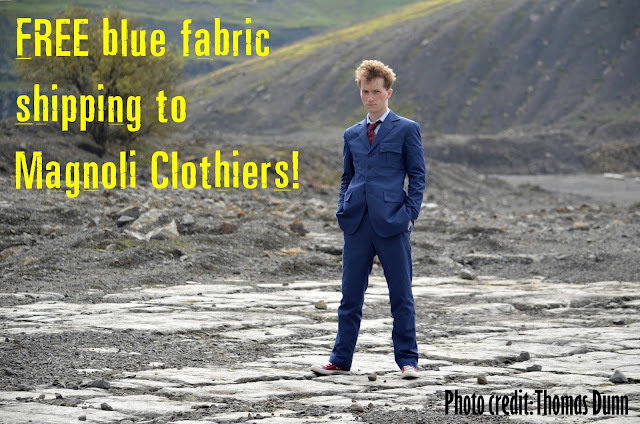 In the mean time, though, I still have some of my rewoven blue fabric available – enough for about 20 suits, and after discussing the matter with Magnoli, we have a good option for those of you who want to have a suit made with my fabric! Up until now, you’ve had to order the fabric + shipping, potentially pay customs fees when the fabric arrives, pay to ship the fabric to Magnoli’s tailors, have it shipped back, and potentially pay more customs fees when the finished suit arrives. However, I’m now willing to offer FREE shipping directly to Magnoli’s tailors, and he can have a suit made for you at a discounted price (including shipping) since you’d be providing the fabric! What this means for you, is that you save money on two international packages (one for the fabric sent to you, and another sending the fabric to Magnoli’s tailors) and potentially eliminate a customs fee! This also eliminates weeks of transit times and the usual hazards of international shipping, like lost packages and delays, so you can be among this leading wave, one of the first people to finally have a proper blue suit! Simply use the promotional code MAGNOLI when checking out on Etsy, and I’ll send the fabric directly to him. 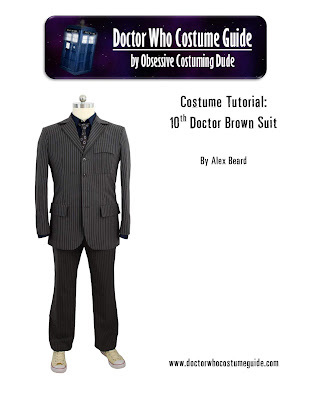 The fabric is still available all on its own, too, so you DIY types who want to make your own suit, my new/updated 10th Doctor suit pattern will be available soon! 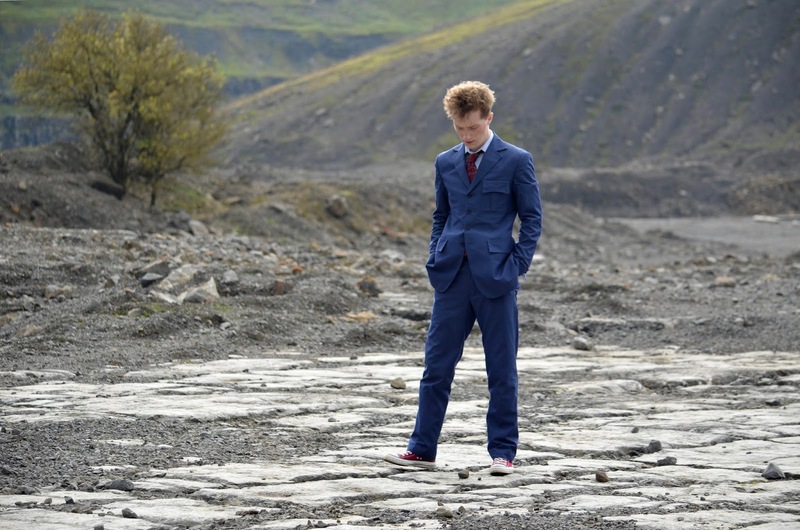 I’m currently in the process of field-testing it with my own suits, and it’s looking great so far (if I say so myself). It’s going to be a HUGE improvement over the previous version! I’ll be posting regular progress photos on Facebook and Instagram, followed by entirely new sewing tutorials here on the blog. Subscribe to my “Costume Guide” e-mail newsletter (upper right) if you haven’t already for updates! As you may recall, last year I set out to dye Magnoli’s 10th Doctor blue fabric closer to the original colors, using a swatch of the screen-used blue fabric (generously provided by Louise Page herself!) as a reference, but despite something like 18 attempts, the results ultimately left something to be desired. Still determined to somehow reproduce a fabric more authentic to the colors of 10’s suit, and with the original shirting fabric no longer being available, it seemed I had basically two other options: help Magnoli update his blue fabric, and to actually have the fabric rewoven, myself. Well, I figured that pursuing both courses of action would essentially double the chances for success – a definite “win” for the Doctor Who cosplay community, since people have been longing for authentic blue fabric for over a decade now! Odds are that at least one of us would get it right! So, after Magnoli expressed interest in updating his blue fabric, I’ve been helping him hone the fabric colors (etc. ), using my swatch of the original fabric as a reference. His fabric update is in the works, and like you, I’m curious to see his final results; it should be a huge improvement! As for my own reweave … Never having had fabric rewoven before, I was at something of a loss as to how to begin – past the obvious Googling, I mean – but I asked around for weaver recommendations, and Daniel Pawlik stepped up to the plate for me! He’d previously had some 11th Doctor shirting rewoven, which turned out fantastic (you can check it out here in his Etsy shop), and he wholeheartedly recommended his weaver. Well, fast-forward nearly nine months (fraught with numerous difficulties and delays neither of us had anticipated), and I finally – finally – have something we’ve all been wanting! With no photo editing (except cropping, I mean), no filters – the “read” is almost perfect! It’s not quite perfect; unfortunately, the stripes are 1mm too far apart. That was apparently the best the weaver could do, and I’ve been unable to shrink them any further. However, I showed Louise Page some comparisons, and she offered her compliments on my replica fabric; what higher praise is there, right?!? So, I have a limited quantity of this fabric available, and unfortunately, it’s unlikely that Daniel’s weaver will ever be willing to do another run of this fabric. There are other fish in the sea, of course, but for now, this is all there is! 4 yards should be plenty for an entire suit; I’m 6’ tall, men’s size 42, and 4 yards is plenty for a suit, with quite a bit left over. For now, I’m limiting individual orders to 5 yards or less, because I want to make sure it’s available to all who want it for as long as possible, but it very well may go fast anyway, so I highly suggest ordering some ASAP if you’re interested! 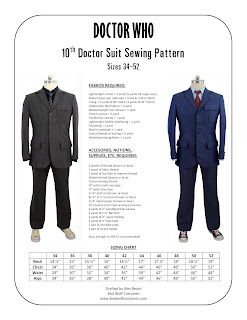 I’ve also temporarily discontinued my 10th Doctor suit pattern, because I’m in the process of updating it! The original version is still fine, if you have it already, but I’m improving the fit so it’s more of a Tennant-esque silhouette, and I’m updating the various alignment guides to coincide with this new blue fabric and Magnoli’s updated (2017) brown fabric. I’ll also be heavily updating my 10th Doctor suit tutorials; I’ve learned a lot the past couple years and do things quite differently now than I did back then. I’ll post here once the updated pattern’s available (hopefully in a few weeks? 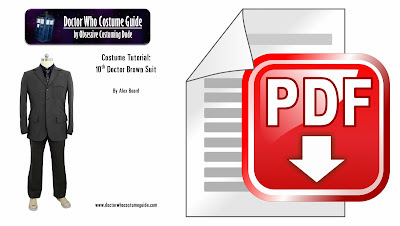 ), as well as once I’ve posted the updated sewing tutorials, but I suggest subscribing to my “Costume Guide” e-mail newsletter (upper right corner) for updates! 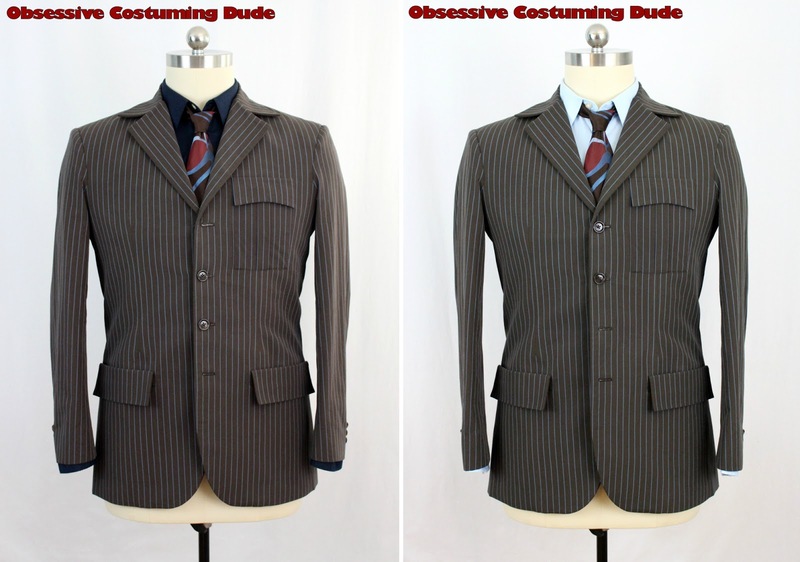 I put together a new sewing pattern bundle that includes all three of my 11th Doctor waistcoat patterns, at a 20% discount! All three patterns include men's sizes 34-52 and as always, they were meticulously drafted to be as faithful to the originals as possible. Free sewing tutorials for all three waistcoats are available here on the blog! More exciting news is coming soon, so check back regularly and subscribe to my "Costume Guide" e-mail newsletter (upper right corner) for updates!